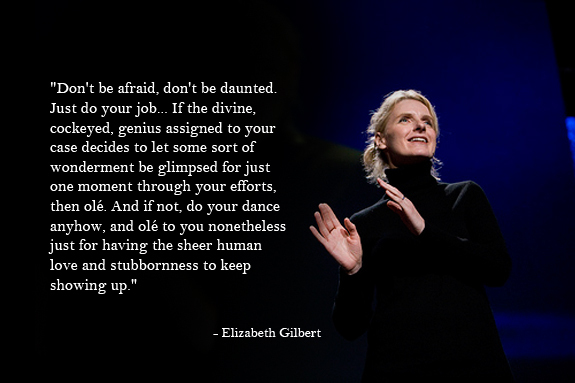 In some corner of an internet rabbit hole, I came across this video, a TED Talk by Elizabeth Gilbert. While it flew in the face of many of my beliefs, it also opened a few possible venues of thought that I found fascinating and inspiring. I believe in the power of people. 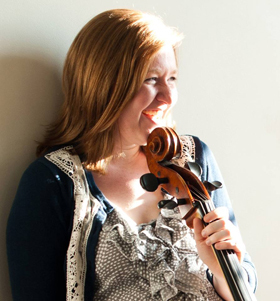 In fact, the entire reason I play music is to connect with people. A wonder-filled moment of sensing truth or an "Aha!" flash of understanding from the audience fuel my artistry. These aren't otherworldly experiences, they are deeply human. So you can imagine how hesitant I am to pass these gifts over to some kind of spirit. However, Elizabeth makes a compelling argument. I have absolutely and repeatedly found myself in the position of questioning whether I can bear my failures - an unavoidable part of the artistic process - or whether pouring myself into something so abstract, subjective, and elusive is just asking for a life of insecurity or disappointment. Often times, the industry-standard response to such insecurities is to "toughen up," to close off the part of yourself that is vulnerable to caring about how your work affects the world. But, that vulnerability is essential to my entire reason for creating. To cut out that vulnerability is to sever the lines of authenticity and empathy that catalyze the most intense experiences music has to offer. Maybe then, Elizabeth's strategy offers a nice psychological tool for creating that little bit of cushion necessary to be completely vulnerable and still survive the darkest moments of living a creative life.